Over the years I have collected various ephemera, with postcards being the main focus of the collection. Unsurprisingly, one of my favorite types of postcards are photo-postcards. Although, my collection is composed mostly of printed cards from the early to mid-twentieth century. This postcard, as is most of my collection, is something I most likely picked up at a flea market or antique store. I have no idea who took this picture nor do I know the people in the picture. However, the purpose of the portrait is clear. 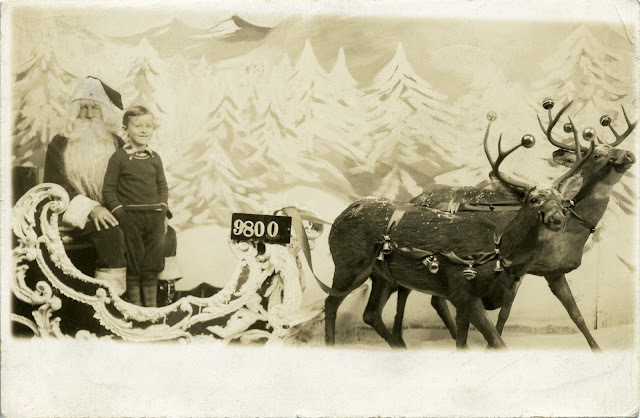 What more memorable image of Christmas can a child have than that of themself with Father Christmas, a.k.a., Santa Claus.